China's top player of the ancient board game of go began a second game against a computer Thursday in a competition authorities limited the Chinese public's ability to see. 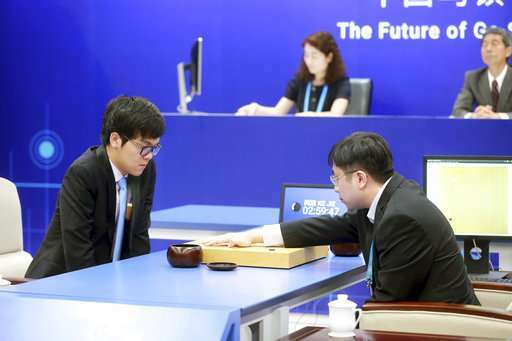 Google's AlphaGo program defeated 19-year-old prodigy Ke Jie on Tuesday in the first of three games they are due to play this week at a forum on artificial intelligence in this town west of Shanghai. Internet users outside China could watch the games live but Chinese censors blocked most mainland web users from seeing the Google website carrying the feed. None of China's dozens of video sites carried the live broadcasts but a recording of Tuesday's game was available Wednesday night on one of the most popular sites, Youku.com. State media reports on the games have been brief, possibly reflecting Beijing's antipathy toward Google, which closed its China-based search engine in 2010 following a dispute over censorship and computer hacking. The official response to the match, a major event for go and artificial intelligence, reflects the conflict between the ruling Communist Party's technology ambitions and its insistence on controlling what its public can see, hear and read. Machines have mastered most other games. They conquered chess in 1997 when IBM Corp.'s Deep Blue system defeated champion Garry Kasparov, but go was considered more challenging. Players take turns putting white or black stones on a rectangular grid with 361 intersections, trying to capture territory and each other's pieces by surrounding them. The near-infinite number of possible positions requires intuition and flexibility that players had thought would take computers at a least another decade to master. Reports by Chinese newspapers and websites on AlphaGo's victory Tuesday were brief, despite Ke's post-game news conference being packed with scores of reporters. None mentioned Google. Government TV in Zhejiang province, where Wuzhen is located, showed a 90-second report about Tuesday's match but few other broadcasters mentioned it, even though go has millions of fans in China and Ke is a celebrity. The communist government encourages internet use for business and education but operates elaborate online monitoring and censorship. The company, headquartered in Mountain View, California, opened a China-based search site in 2006 and cooperated with official censorship. That prompted complaints from human rights and other activists and free press groups such as Reporters Without Borders. The company shut down its China search engine and visitors were automatically transferred to another Google service in Hong Kong, but that stopped after Chinese authorities objected. Online filters slow access to the Hong Kong site enough to discourage many users. Why on earth does the Chinese government not want its people to see this event? Do they somehow regard it as 'anti-communists' or 'anti-Chinese-government' and, if so, in what way? I fail to see how they could be harmed propaganda-wise if they showed it. This kind of stuff is why I became a Libertarian. The "elite" in government believe they should "protect" the lowly citizens from the evils of Google Go.